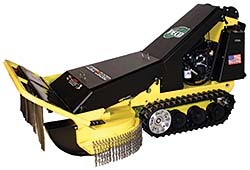 The TBB-3002 Brush Blazer features a 48-inch cut width and can tackle trees up to 4 inches in diameter. It is available with a 28 horsepower (hp) Briggs & Stratton Vanguard or 27 hp Kohler EFI engine. In optimal conditions, the unit can clear up to 6 acres per day and complete twice the work with one-half the staff. A 5-gallon tank allows a run time of four-six hours, depending on terrain and material. The rotary brush cutting system features two 1/2-inch steel discs with three steel flail blades. The cutter weighs 1,250 pounds, is 59 inches wide and 96 inches long.